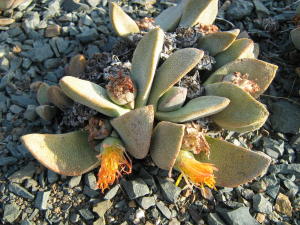 Observation - Pleiospilos compactus subsp. canus, Leeu Gamka - Southern Africa. Description: Forming clumps up to 30 cm diam. Leaves speckled. This population obliterated due to roadworks. Forming clumps up to 30 cm diam. Leaves speckled. This population obliterated due to roadworks.